"Obviously," Lopez said, "you can go on about injuries in this league; those will happen. But it took us a while to get our core guys together and getting OP (Otto Porter Jr.) and knowing how the season has felt in the past couple of months, the feeling in the locker room, I know this group could do some special things." Asked if he believes this can be a Bulls playoff team next season, Lopez answered directly: "I genuinely do, I genuinely do." Though it's uncertain whether Lopez will be in at all. That's because the 31-year-old seven footer is an unrestricted free agent. And in another unexpected curiosity in this most curious season, the Bulls will have a difficult decision to make on a player about whom the decision was long ago made. It seemed like after two productive seasons as part of the Derrick Rose trade, Lopez' future was past prologue with the Bulls. The Bulls had drafted a center, Wendell Carter Jr., with their No. 1 draft pick last June. Lopez became a frequent DNP-CD participant to start the season, trade talks were ongoing and a buyout or even a release seemed certain. 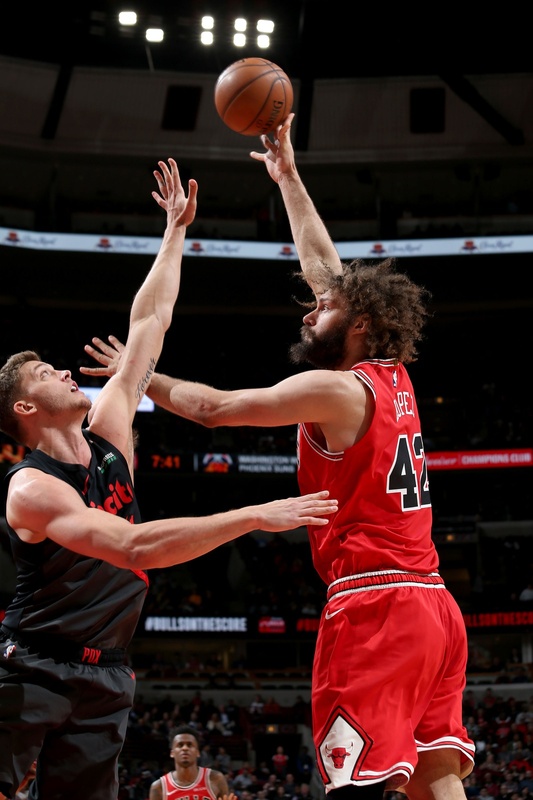 Yet as the Bulls Wednesday play in Washington with four games left in the season, Lopez not only is the last man standing among a roster of former minor league role players, but he continues on the most impressive and ambitious scoring sequence of his career. With his 29 points against the Knicks, which was just one short of his career high game, Lopez has scored at least 20 points seven times in the last two months. It's the second most 20-point scoreing games he's had in a season in his 11 seasons and the most during any two-month stretch in his career. 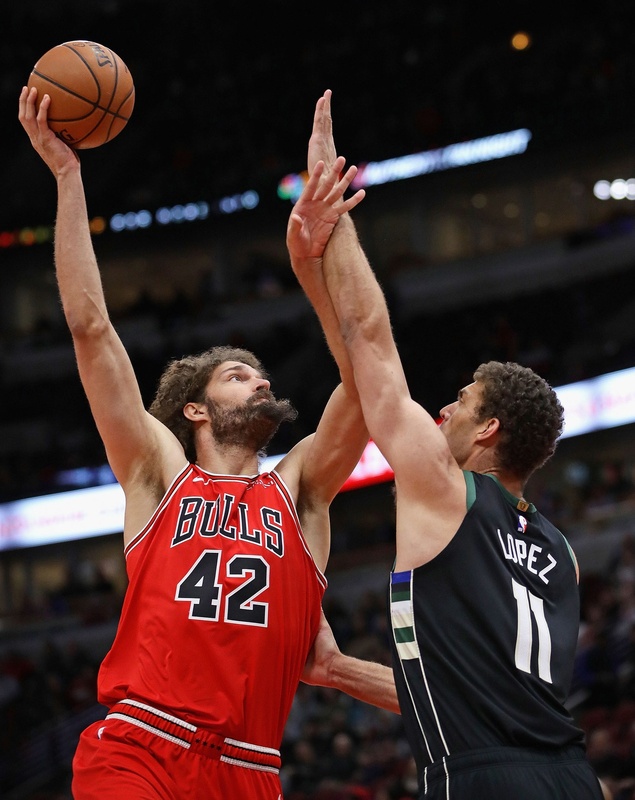 Lopez has been known primarily as a defensive player, the yin to his twin brother Brook's offensive yang that even has expanded with three-point shooting for the high flying Milwaukee Bucks. Talk about phrases not used much before. Like Boylen after Monday's game saying of Lopez' scoring, "He was dominating when he was in there." With his powerful body and size, Lopez has matured relentless spin moves in the post that have become consistent and reliable. He recently had a career best stretch of games scoring at least 17 points with at least 20 in three of four. To put it in perspective, in six of Lopez' first seven seasons in the NBA, he had a total of four games of at least 20 points. He had an aberrational 10 such games in the 2012-13 season, his first with the New Orleans Hornets. But he didn't have at least seven until this season. And he didn't have his first until February because he wasn't even in then coach Fred Hoiberg's playing rotation to open the season while handling a half dozen DNP-CD assignments of being benched the first month. The Bulls reportedly searched out trades, and then even after the coaching change the rumors were Lopez would be a buyout candidate for a playoff team, perhaps even released. Lopez is often considered something of a character with his feud with NBA mascots and his hirsute appearance likened to a Simpsons show figure. He's the go-to actor for Bulls TV skits involving children and recently an Alice in Wonderland parody. But that belies a professional basketball character that is first class. "Robin's had a hell of a year in a lot of ways," said Bulls coach Jim Boylen. "What he's meant to me is a veteran guy who cares about the team, cares about practice, about improving. He's practicing his three-point shot, playing over both shoulders, a willingness to be coached, take responsibility for poor play, the things we talk about and are important for an NBA team to have examples of and he's been that guy. He's feisty, tough and embraces contact. He likes collision. We like those kinds of guys. He's been great on all levels; his professionalism's never waned." Perhaps that's more vital even if it's not exactly in the box score. I enjoy the people we have in and around this locker room. I think part of it is they've shown me a lot of respect. Both (organization and players). So I'm trying to show them a little respect, too. First, Lopez actually believes in the sanctity of the NBA contract, which at least disqualifies him from ever being a player agent. "As far as the buyout goes, I feel that there's kind of a contract there," said Robin. "And you want to respect that a little bit." Yes, in sports. Quaint, eh? And in this period of the season with so many players injured and in precautionary sequences and teams heading toward lottery odds goals, it would be easy for Lopez to take a time out. But he doesn't; he won't. "Maybe my plodding style has its benefits," Lopez said with the frequent wink in his voice. "Obviously, I think we've got a great training staff. And as you go through the league, you learn how to manage your body, manage your minutes. I certainly did. "I've always enjoyed the guys on the squad as long as I've been here," Lopez said. "Any chance I get to see the floor with them, I try to relish the experience. First and foremost, I enjoy the people we have in and around this locker room. I think part of it is they've shown me a lot of respect. Both (organization and players). So I'm trying to show them a little respect, too." It's perhaps the definition of being a professional if anyone could figure out what it is. Sure, you'd rather have LeBron James or Kevin Durant or Stephen Curry or some cool nicknamed Greek guy. Fans pay for the wins, not the sentiment. And it's not like because someone doesn't rob a bank, no one else will. Still, it's good to have someone around whom you can rely upon. Ryan Arcidiacono is the only one who has played more games, though basically Lopez only has missed games for the DNP designations and the often annual suspension for some contretemps. He cares in many ways. Inequity bothers him as well. Though it is nice to know you have a teammate who'll be there if there is a disagreement. Plus, Lopez has been something of a revelation as an offensive player moving into his second decade, of all times. Though his season average is a seven-year low of 9.4 points per game, he averaged 15.5 points in February, 13.8 in March and is tied for third in the NBA in scoring in April. Sure, it was just the one game with 29 points. But there was no way I was missing the chance to write that sentence about Robin Lopez. "We have a lot of talented players on our team," said Lopez, who tends to withdraw from the individual spotlight. "You saw when they were aggressive they were able to get to the basket at will. I was trying to help out in other facets of the game. But defensively I could have been better." But about the tip dunk, which was the highlight play of the game? "I cannot (explain that)," Lopez said haltingly. "Some things just happen. I thought that was cool. You know I don't like talking about myself, but I was more impressed...it's my birthday, so I'm going to take a little (liberty). I was more pleased with the one handed hook shot. Everybody looks to expand their game. That's how you keep yourself in this league, in this game. It's been great just to be out there on the floor playing with the guys. Obviously, a lot of times I'm just playing off them. They are making great plays and I'm playing off them." And even if 21-57 doesn't seem like much fun and it's unlikely Lopez had heard of any of his current fellow starters before this season, he's embraced this rebuild like few others. "I think everybody's done a good job of keeping his spirits high," said Lopez. "I do think we've been rewarded these last two months of persevering. We kind of see what our potential is and what we need to get to." "I think there are a lot of different facets (to free agency)," Lopez acknowledged. "A big part of it is obviously what's presented on your plate. Obviously, anybody in the NBA would love to be on a competitive squad. And I do think this squad has a chance to be very competitive next year. It is a business. You're looking out for your family as well. Those are the two biggest factors for me." And surprisingly another decision for the Bulls.